This book tells a uniquely American story of faith in action. From its 1882 founding by a handful of men from a small, predominantly Irish Catholic parish in New Haven, Connecticut, the Knights of Columbus has grown to an international brotherhood of nearly 2 million members across North America and throughout the world. Formed by Father Michael J. McGivney with the men of his parish, the new fraternal organization was committed to the principles of charity and unity, while supporting the faith and financial viability of its members and their families. From its earliest days, the organization made the case that one could be both a good Catholic and a true American citizen, pushing back against the religious discrimination that was all too common. It would soon grow into an organization whose members supported one another while also contributing to their parishes, their communities, their countries, and the world. Lavishly illustrated with hundreds of beautiful photos, The Knights of Columbus: An Illustrated History presents the story of this remarkable organization—and the many ways in which it has helped individuals, while also helping shape American and world history at key moments. You will discover the Knights’ decisive contributions during times of disaster as far back as the San Francisco earthquake and fire of 1906 and as recently as Hurricanes Katrina, Sandy, and Harvey. 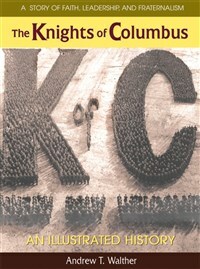 The book presents K of C's very public resistance to the Ku Klux Klan and its message of hate in the 1920s—just one example of the Knights’ stand against bigotry. Also featured is the Knights’ respect for the importance of education, as the group worked to rectify the historical inaccuracies of the nation’s textbooks and narratives during the 1920s. That work would help to tell the previously overlooked stories of America’s Catholics, African Americans, and Jews, among others. Also highlighted is the organization’s active role in the fight for religious freedom throughout the world, from its involvement in ending the Mexican government’s persecution of Catholics during the 1920s to its current work to end persecution of religious minorities in the Middle East and provide assistance for ISIS genocide survivors. K of C support for America’s troops and veterans saw soldiers through two world wars and continues today. In nearly a century and a half since its humble beginnings, the Knights of Columbus has touched the lives of countless individuals—Catholic and non-Catholic—in communities around the world. Through war and peace, it has remained the “strong right arm of the Catholic Church,” helping its neighbors next door and around the world with help and hope, faith and freedom. Andrew T. Walther received his BA and MA in Classics from the University of Southern California, where he also taught writing for several years, earning the University’s Excellence in Teaching Award. Since 2005, he has worked at the Knights of Columbus and now serves as Vice President for Communications and Strategic Planning. Maureen H. Walther received her BA in Comparative Literature at Princeton University, with a minor in Medieval Studies. She served for ten years as Special Assistant to the CEO of the Knights of Columbus working on research, writing, and publishing projects.